Wallpaper rotator is a portable tool used to change your windows wallpaper. The easiest method to change you windows wallpaper anytime you like. Just run Wallpaper rotator. The program will select a wallpaper from a specific user-defined folder where you have copied your favorite wallpapers, change the wallpaper and then gracefully exit without consuming any memory of computers resources at all. You can easily configure wallpaper rotator to automatically start with windows so that you have a fresh new wallpaper every morning. Designed as the portable edition of 100dof Wallpaper Rotator, this is a simple-to-use software application that allows you to configure a automatic system for changing the desktop wallpaper. It offers support for BMP, ICO JPG and PNG images. Since there is no setup pack involved, you can drop the program files in any part of the hard drive and just click the executable to launch the app. Another possibility is to keep it stored on a USB flash drive, in order to directly run it on any PC with minimum effort an no previous installers. Plus, it doesn't modify the Windows registry settings. Based on a standard window with a neatly organized structure, the interface lets you immediately dive into the configuration procedure. You can indicate a folder whose containing images will be automatically taken into account for wallpaper rotations, provided that their file types are supported by 100dof Wallpaper Rotator. It's possible to include or exclude subfolders, follow any existing shortcuts to files or folders, specify the image order (alphabetical, unsorted or random), pick the wallpaper style (tile, center, stretch), preserve the original aspect ratio, stretch images from the inside or outside, customize the background color, as well as enable or disable automatic color selection. In addition, you can ask the tool to remove the current wallpaper, and to re-apply it. All changes are applicable with the click of a button. Unsurprisingly, the app has minimal impact on computer performance and runs on low CPU and RAM. It doesn't hang, crash or prompt error dialogs. 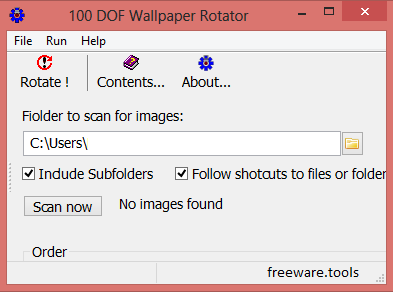 All in all, 100dof Wallpaper Rotator delivers a simple method for setting up an automatic system for rotating the desktop wallpaper. However, it lacks many practical options.